Jonah begins receiving strange letters with cryptic messages in the mail. He thinks it is a prank until his friend from school receives them also. They find out that they are two of a group of “missing” babies that were adopted out when a plane filled with them appeared mysteriously late at night at an airport 13 years ago. What a page-turner! 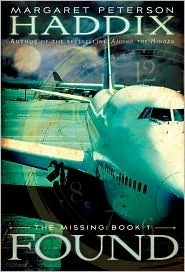 This is the first in a series called, “The Missing” and I’m looking forward to reading the next one. This is a great one for those 5th grade through middle schoolers in your lives who like series books. Or adults like me who just love children’s literature :). I finally got my copy of New Moon from the library! Yay! I’ve been dying to start reading it!